After using MS Office for a while, there may come a time when apps act unstable or crash for no apparent reason. 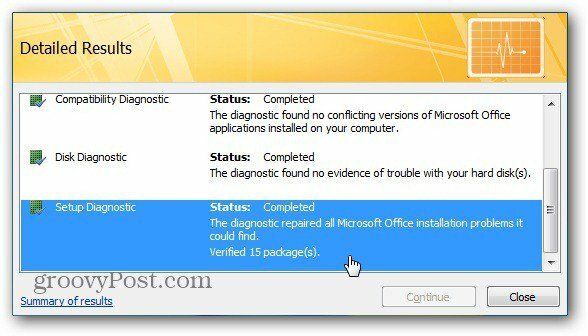 A great place to start troubleshooting the issue is using the Microsoft Office Diagnostic Tool. After using MS Office for a while, there may come a time when apps act unstable or crash for no apparent reason. In fact, your system won’t even pop up any error messages. 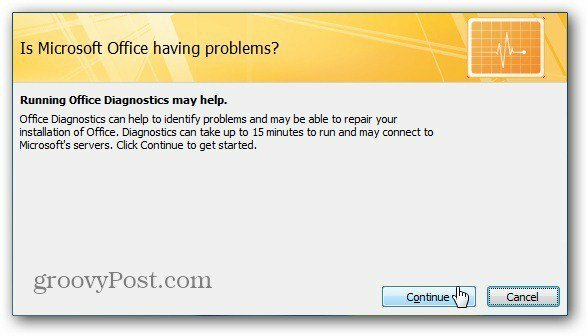 A great place to start troubleshooting the issue is using the Microsoft Office Diagnostic Tool. 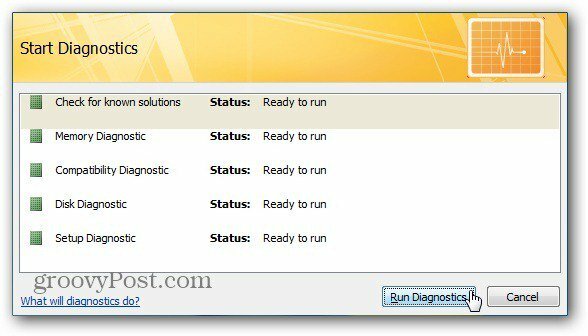 To run Office Diagnostics in Office 2007, click Start >> Microsoft Office >> Microsoft Office Tools >> Microsoft Office Diagnostics. The Office Diagnostic Tool comes up. Click Continue. Next you see a list of five different diagnostic checks it will run. Click Run Diagnostics. Now wait while each diagnostic check is performed. It can take up to 15 minutes or more for the diagnostic checks to run. Each system is different so your mileage will vary. When complete, you’ll get an overview of how many errors were found and repairs that were made. In my example, there was one error and the Diagnostic Tool repaired it. To get more information, click Detailed Results. 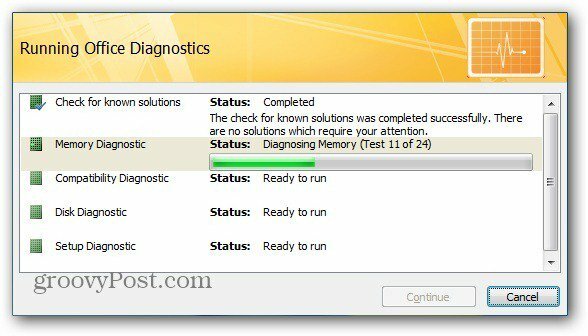 This give you more on what the error was and what the Diagnostics tool did. In this example there was a missing file and the Diagnostics tool added it for me. 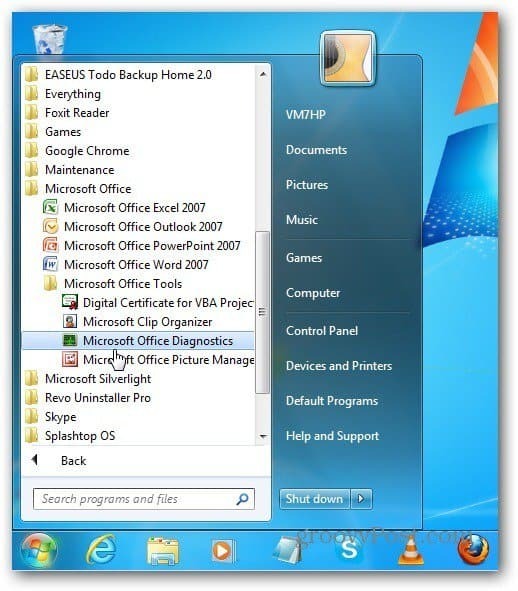 Microsoft has removed the Diagnostics tool from Office 2010. But you can still run an Office repair if you’re experiencing problems. Click Start and type Programs and Features into the search box. Hit Enter. 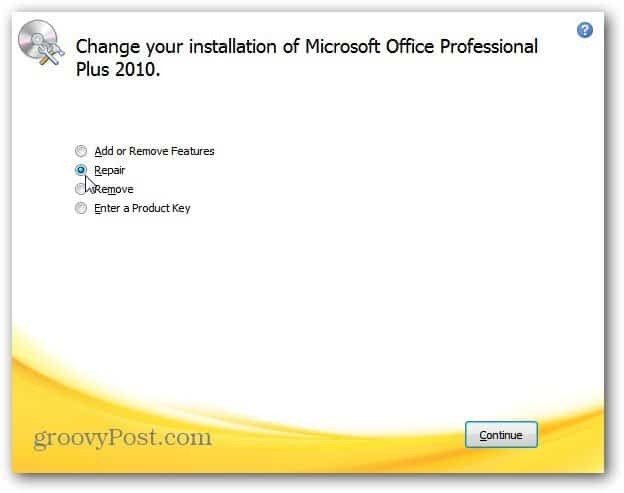 Now scroll down to the version of Microsoft Office 2010 you have installed. Right click on it and select Change. When the following screen comes up, select Repair then Continue. Now wait while MS Office goes through and does a repair installation. Microsoft Office really buries itself deep into Windows. 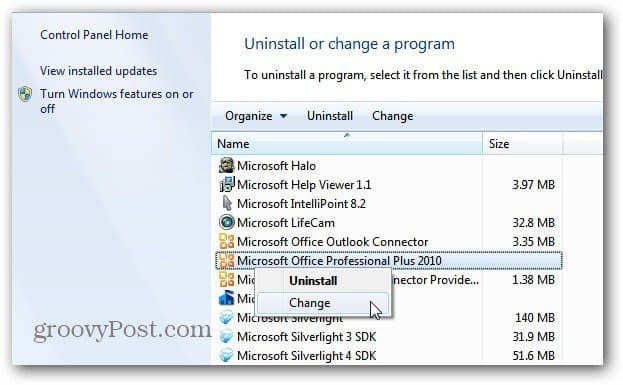 If neither of these steps fix the issue you’re having, it’s best to do a complete uninstall and reinstall the office suite. 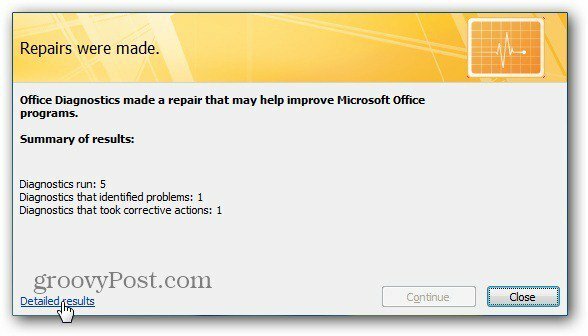 If you’re having problems with Outlook check out how to run PST Repair Tool. I don’t have the option to repair, and the Change option just flashes a box on the screen with no additional options.